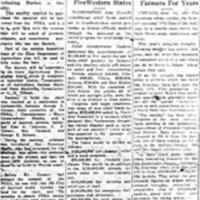 Newspaper article in the <em>The Sanford Herald</em> detailing the Federal Emergency Relief Administration's plans to begin construction of the Sanford State Farmers' Market in 1934. Photocopy of original newspaper article: "FERA Will Furnish Labor, Materials to Build Market Here: Immediate Construction of $75,000 Plant Authorized at Meeting Today." The Sanford Herald, June 11, 1934: State Farmers' Market Collection, Museum of Seminole County History, Sanford, Florida. Original newspaper article: "FERA Will Furnish Labor, Materials to Build Market Here: Immediate Construction of $75,000 Plant Authorized at Meeting Today." The Sanford Herald, June 11, 1934. Digital reproduction of photocopied newspaper article: "FERA Will Furnish Labor, Materials to Build Market Here: Immediate Construction of $75,000 Plant Authorized at Meeting Today." The Sanford Herald, June 11, 1934. The Sanford Herald, June 11, 1934, page 1. “FERA Will Furnish Labor, Materials to Build Market Here: Immediate Construction of $75,000 Plant Authorized at Meeting Today.” RICHES of Central Florida accessed April 21, 2019, https://richesmi.cah.ucf.edu/omeka/items/show/1157.